The new Apple Airpod are wireless headphones whose design is one of the most bizarre and controversial that has appeared in the company….. The elimination of the headset port on the new iPhone 7 and iPhone 7 Plus brings several drastic decisions like that have to get an adapter for traditional headphones with all new mobile and Apple, like other handset manufacturers, are forced to switch to wireless headphones. Thus become the first Apple wireless headphones, the new Airpod. This is a set of headphones that yes, could remind that Bluetooth headset for hands-free, but nothing or very little to see. The AirPods have a new Apple chip called W1. This is responsible for pair the headset with iPhone quickly. It is not a question of Bluetooth or of NFC; Apple does not say which technology uses although it shuffles to be WiFi Direct. But allowing is to pair it with the phone quickly and forget the frustrations; moreover, the company says that they use this chip to transmit two-way audio. It can be used with Siri and although it have sensors that allow you to stop the music or “call to Siri” to control the volume or change tracks, you will have to give a command to Siri. According to Apple these AirPods get a range of 5 hours of playback, but thanks to the box used for storage, you can add another 24 hours. Moreover, with a load of 15 minutes can last for 3 hours. What most draws the attention of the new AirPods is its design, practically EarPods headphones that come with every iPhone sold but without the cable. And that is its main disadvantage: the design. It is not exactly pretty. Others like the Samsung Gear IconX or Bragi are committed to use a design that is best inserted in the ear, not with that rare white part that sticks out. We must also add that the design of Apple headphones are especially slippery for many people, do not fit well and end up falling, although it depends a lot on the individual and how to use them. Although who has tried it say they feel fixed when put it, not risk using it while doing sport. 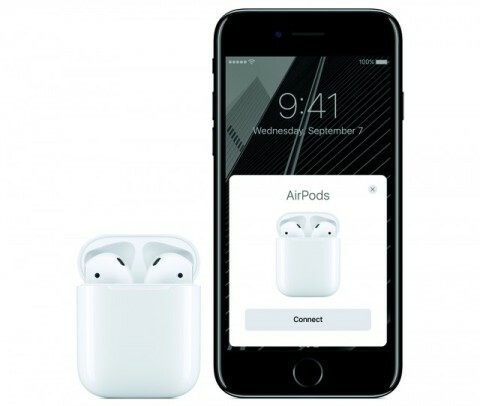 The new AirPods go on sale in late October for 179 euro, a price that is up to its competitors that will work with the iPhone, iPad and MacBook upgrade to the latest version of iOS or MacOS.